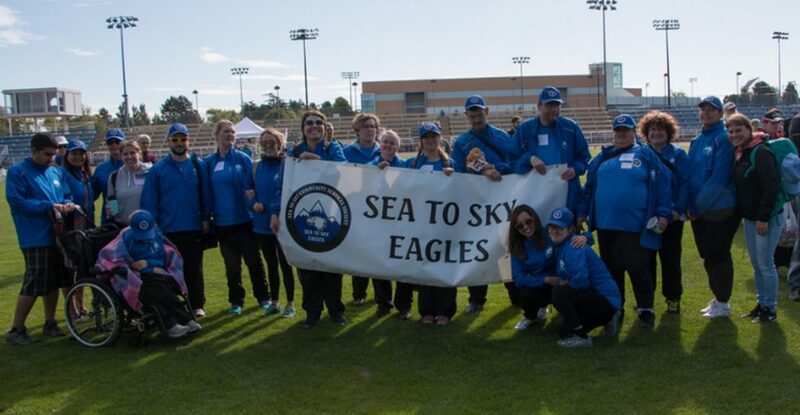 Every June our Sea to Sky Eagles attend Operation Trackshoes, a sports festival for the citizens of British Columbia with developmental disabilities. Operation Trackshoes is one of the programs offered through Community Living Services as part of our Life Skills and Community Access program. These programs help people with developmental disabilities to become more independent, through one-on-one support and group activities. Accessing community resources like banks and shops, practicing communications and social skills through making friends and interacting with others is facilitated and is an integral part of the program. Our participants thrive in a positive environment where they learn together, help each other, and cheer each other on. Operation Trackshoes is made possible by the support of local businesses and volunteers.